The distinction between the two is huge. “Tactical Marketing” is the execution of your marketing plan – and the tasks you action each day – write blogs, post social content, run events or send emails – that implement the strategy. 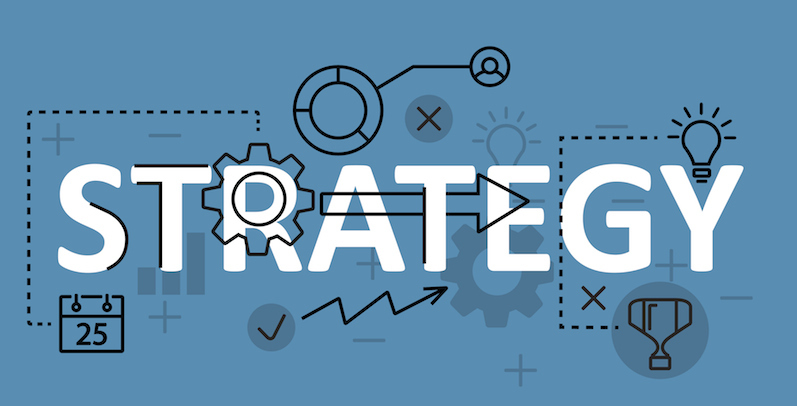 If your strategy is wrong, you might execute the associated tactics perfectly, but it will be a waste of time and money, as the strategy will not deliver the results that you want. This is why it is always critical and cost-effective to spend the time and effort in ensuring that you have a marketing strategy that is right before you deploy any of the associated tactics. Remember – only by getting your marketing strategy right will your marketing tactics drive the overall success you want. Defining a valid marketing strategy followed by successful execution enables businesses to grow in an ever-changing and increasingly competitive marketplace. Small businesses often have to compete in a highly crowded market against big players with much bigger marketing clout, so setting yourself apart is never going to be easy. In essence, your marketing strategy is an explanation of the goals you need to achieve with your marketing efforts. Your marketing strategy is shaped by your business goals. So, your business goals and your marketing strategy should go hand-in-hand. Your strategy can only be determined if you understand your own strengths and weaknesses, those of your competitors and value as defined by your target market. Being strategic means you have taken a step back and reviewed your brand, value propositions and key messages. It also means you have looked at the competition, stakeholders and/or market. Once you have clear marketing goals and a well-defined strategy, your marketing will be more focused and you can make more effective use of appropriate marketing tactics to grow your business. There is no point sending out press releases, posting on social media or spending money on marketing if you have no idea, for example, of your audience, stakeholders or market, or their media preferences. So – with the right strategy in place, your marketing programs and advertising will get the attention of your target customers and facilitate their decision-making to buy your products and services. By understanding what’s important to your target market, you will put together a strategy that gets more qualified prospects to call you, reduces your sales cycle and costs, and increases your conversion ratios. Without an effective marketing strategy you won’t achieve the results you want, no matter how much time and money you spend. How can you develop the right marketing strategy for your growth plans? GetSet consulting is unique because we integrate and focus on the two critical disciplines of marketing and finance, the engine drivers of business and the two areas that are essential for sustainability, growth and scale. Our client base of SMEs, turn over anything from <£500,000 to £20 million and trust us to guide them on their growth journeys. We provide a variety of different services to help businesses develop and deliver effective marketing to deliver their growth objectives. Our consultants can bring an external perspective to your business, plus an objective point of view. Since we work with a wide variety of clients, we will have frequently tackled similar problems in other businesses, which will inform the best approach to take for your business. After an initial 1:1 meeting with one of our consultants, we can advise on the best way to work with you, be it on a project consultancy-basis or perhaps, providing mentoring to yourself or your senior leadership team. You can book a free consultation with one of our business consultants via our website. The other way that you can learn about marketing strategy to help your business grow is by attending one of our Masterclasses. We run Masterclasses on a regular basis throughout the year, focusing on different ways to help your business grow, e.g. creating successful marketing strategies, or finding sources of funding for your next growth phase. You can find out about and book onto one of our latest Masterclasses via our website. Checklist – Have you got your marketing strategy right? Remember, getting your marketing strategy right is critical to your future success. GetSet have the experts available to ensure that you do – do please get in touch today and we will be ready to help you.